This is a wonderful, simple, old fashioned dish: Prasorizo. 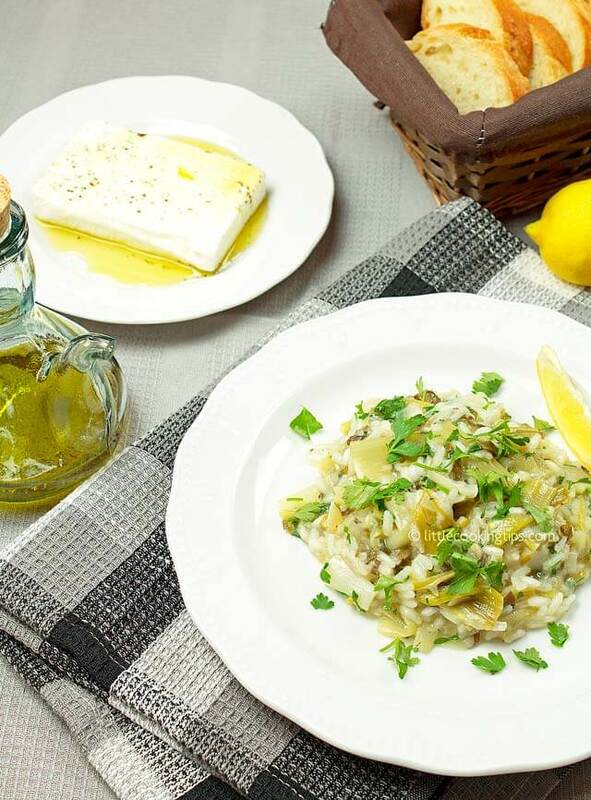 One of the most common vegan Greek dishes, prasorizo literally means "rice with leeks". Like spanakorizo (rice with spinach) and lahanorizo (rice with cabbage), those dishes are among the ones you won't prefer as much as a child, but you'll definitely appreciate much much more when you grow up. The Greek version of the Mediterranean diet considers those dishes important. Plus they can become a full meal with some help from a good chunk of barrel aged feta and some fresh, crusty, artisan bread and contain lots of nutrients. But let's go back to our humble but nutritious meal: Prasorizo (and spanakorizo, and lahanorizo) are the Greek cuisine risottos. The rice used is Karolina, a short/medium grain variety that's locally grown in Greece. You can use Arborio or Carnaroli abroad, the result is equally creamy. Since the rice is high in starch, this dish doesn't take long to cook and requires your attention. Because of the starch, if you don't stir the food often, the rice tends to stick at the bottom of the pot (just like with the Italian risotto). So, for those 30 minutes it will take to cook, be around the kitchen and take care of the food, so it'll take care of you in return. In this dish, we used parsley. Others may prefer dill, or fennel leaves. The end result is different and equally interesting, so feel free to try either one. Many people also cook this dish adding a bit of grated tomato and/or tomato paste. We provide the simplest version here, which is served with a few drops of fresh lemon juice. You can also try adding some tomato to get a different (equally tasty) result. In this case, add the tomato along with the water. Make sure to find the best quality feta to accompany this dish (unless you're a vegan), and some good crusty bread. Sprinkle a chunk of feta with extra virgin olive oil and black pepper or dry oregano and serve the creamy, soft rice with leeks. Cut most of the green part of the leeks and the root end. Slice lengthwise and then chop them in 2.5cm/1in slices. Put the pieces in a colander and rinse thoroughly to remove any dirt that may be trapped in the green part (pic. 1). Pour the olive oil in large pot and put it on medium to high heat. Once hot, add the onion and the spring onions (pic. 2). Sauté for 3 minutes, until they become soft and then add the leeks (pic. 3). Cook for about 10 minutes, until they soften well, stirring often. Add the rice (pic.4), stir for half a minute and pour the wine. Allow most of it to evaporate, about 2 minutes, and then add the water (pic. 5). Once the water starts simmering, reduce the heat to medium/low and cook for about 20 minutes. You must cook the food in a low simmering. Stir often, especially during the end when there's less water left in the pot. At this point the prasorizo is ready (almost all of the water must have been absorbed). Turn of the heat and add the parsley. Stir for 1 minute and add salt and pepper. Be generous, this food requires lots of both. That's it! Sprinkle some fresh parsley and fresh lemon juice on each dish and serve with feta and good crusty bread. Kali oreksi! 1. As mentioned above, don't be afraid to add a bit more salt and pepper in this food, it requires it. 2. You can also use dill or fennel leaves instead of parsley. 3. You can use this dish as a side for sausages or grilled burgers. 4. You can also add grated tomato and/or tomato paste along with the water for a different result.